Nose: Sherried indeed with raisins and orange peel but also a lot of pine resin and some rawer oak along with a lot of woody spice (clove, cinnamon). The raw wood subsides quickly and there’s more salt now. With even more time the pine subsides as well and now it’s more conventionally sherried with toffee and light salted caramel. With water there’s some apricot jam and lemon peel. Palate: As on the nose, the wood is to the fore but there’s no pine here: instead there’s a fair bit of raw wood (pencil shavings), just this side of being too tannic. Dried orange peel as well and the spices from the nose. More salt on the second and third sips but I’m not getting the sweeter notes from the nose–the clove seems to intensify. Water pushes back the wood and brings out some citrus; the tannic wood turns into a more pleasurable peppery counterpoint. Finish: Long. It’s the wood that makes the strongest impression, but it gets far less raw past the swallow. Some bitter caramel too. At the very end there’s a slight taste of blood in the mouth as sometimes happens with not fully integrated sherry (and no, my gums aren’t bleeding–I checked). Less wood and more citrus on the finish too with water. Comments: An oddball for sure, with conventional sherry character thrown for a curve by the wood influence, which seems more extreme than I would expect from a refill cask. In fact, neat, that pencil shaving note on the palate puts me in mind of my terrible bottle of the Balcones Brimstone, though it’s not as out there as that. I liked it better with water. On the whole, more interesting than their 20 yo, 1990 cask, but I’m not sure I like it enough to justify a much higher score. 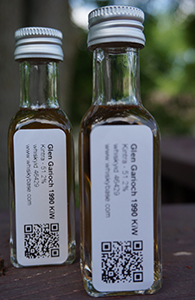 This entry was posted in -Whisky by Rating, 85-89 points, Glen Garioch, Kintra Whisky, Whisky by Bottler. Bookmark the permalink.